Canine Performance Centre has highly skilled and accomplished instructors in the fields of agility, puppy and obedience. Whether you are a serious competitor or just looking for fun classes, CPC’s instructors can help you achieve your dog training goals. Tracey is the owner of C.P.C (Canine Performance Centre), she started her dog training career in 1997 with her GSD Jessie a high drive, high energy, obedience, agility and protection work partner. Jessie competed in “B” test and achieved top KUSA grades in both agility and dog jumping earning a dog jumping QC. She was consistently invited to top dog invitational events and competed at the agility SA championships for a number of years. She loved her career at K9 training centre (obedience, tracking, working trial and protection work school) where she achieved a number of club awards including the Top Field Dog and their most prestige’s Dog of year title 3 times. Tracey continued her training career achieving many honours with all her dogs including qualifying 2 dogs to join a therapy work programme. She opened PuppyLand training school in the year 2000 after completing a number of years of teaching obedience under the guidance of Chris Waldron at K9 Training Centre. Her more recent achievements include her border collie Jenga who has achieved champion status in agility and non contact agility as well as competing at numerous interprovincial dog jumping events. Jenga won the 2013 Kusa National agility title QC and was the reserve 2013 Kusa National non contact winner. In previous years he partnered his Flyball team to win the Kusa National championships in 2011 and 2012. Jenga has ranked in the top 10 at the SA agility championships in 2013, 2014, and 2015. Jenga is a 3-way champion but his greatest passion and achievements lie in Flyball where he has attained his grand championship title and was awarded his provincial Flyball colours in 2014. Traceys border collie Sassy (UK Import – Kennels Comebyanway) has achieved grand champion status in Flyball and Non contact agility. She is a further champion in Agility and Dog jumping making her a 4–way champion. Sassy competed at the Europeon Open in 2013 after attending the international agility workshops in Germany. At the European Open (Held in Belgium) she ranked 40th out of over 800 dogs during the month of her 3rd birthday. Sassy was invited to be the white dog for the large individual events at the FCI world Championships in 2013, held in South Africa. Sassy holds two CAICIAG certificates and won the NAPC Top dog event in 2014. Sassy was the top qualifying large dog in South Africa for the 2014 SA Championships qualifying runs. At the event hosted at the Royal Agricultural show in May 2014, she won two rounds giving her an overall ranking of 6th in the country. 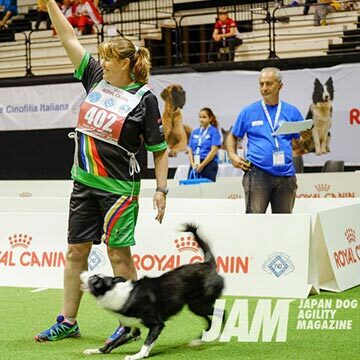 Sassy qualified to represent the Kennel Union of South Africa at the FCI World Championships in Luxembourg October 2014 but unfortunately due to injury she didn’t attend this event. She was privileged to qualify for SA Championship trials again in 2015 coming second overall (reserve SA champion) and qualifying to represent the KU of South Africa at the FCI Agility World Championships in Italy in 2015. Sassy earned her Gauteng provincial dog jumping colours in 2014 and her Gauteng provincial agility colours in 2015. Traceys young dog Esprit (Import UK) has just started her career but is already in the top grades for agility, non contact agility and dog jumping (with a QC). 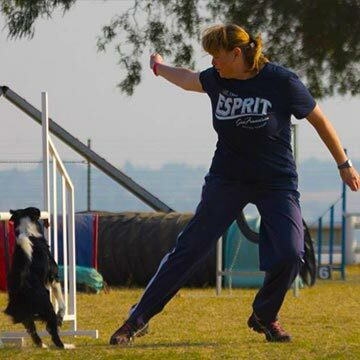 Esprit is an enthusiastic agility competitor showing tremendous potential. 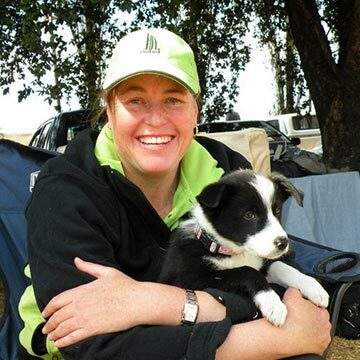 Tracey studied Ethology under the late professional Odendaal at the Pretoria Technikon and was accredited by the Animal Behavioral Consultants of South Africa as a Canine Behaviourist. She is registered with the South African board for companion animal practitioners (SABCAP). Her learning has extended to clicker training and she has a sound understanding of learning theory principles. Tracey is a qualified champion show agility judge (2015). She is affiliated to the SuperPup training programme.